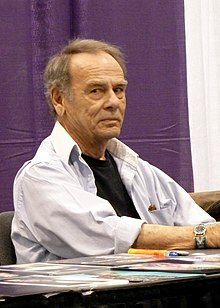 Dean Stockwell (n. 5 martie 1936 ) este un actor, actor de televiziune, actor de film din Statele Unite ale Americii, care a primit de două ori Premiul Cannes pentru cel mai bun actor. 1945 Abbott and Costello in Hollywood Dean Nem. 1947 Song of the Thin Man Nick Charles, Jr.
1951 Cattle Drive Chester Graham, Jr.
1957 Wagon Train Jimmy Drew Episodul: "The Ruth Owens Story"
1957 Wagon Train Juan Ortega Episodul: "The Juan Ortega Story"
1958 Cimarron City Bud Tatum Episodul: "Kid on a Calico Horse"
1959 Wagon Train Rodney Lawrence Episodul: "The Rodney Lawrence Story"
1959 Buick-Electra Playhouse n/a Episodul: "The Killers"
1959 Johnny Staccato Dave Episodul: "Nature of the Night"
1960 Checkmate Roddy Stevenson Episodul: "Cyanide Touch"
1960 The DuPont Show with June Allyson John Perry Episodul: "The Dance Man"
1960 Stagecoach West N/A Episodul: "Red Sand"
1961 Wagon Train Will Santee Episodul: "The Will Santee Story"
1961 The Twilight Zone Lt. Katell Episodul: "A Quality of Mercy"
1961 Alfred Hitchcock Presents Billy Weaver Episodul: "The Landlady"
1963 Combat! Rob Lawson Episodul: "High Named Today"
1964 Kraft Suspense Theatre Martin Rosetti Episodul: "Their Own Executioners"
1969 Bonanza Matthew Rush Episode: "The Medal"
1972 Columbo Eric Wagner Episodul: "The Most Crucial Game"
1973 Mission: Impossible Gunnar Malestrom Episodul: "The Pendulum"
1973 Night Gallery Charlie Evans Episodul: "Whisper"
1973 The Streets of San Francisco Paul Thomas Episodul: "Legion of the Lost"
1975 Columbo Lloyd Harrington Episodul: "Troubled Waters"
1975 Ellery Queen Cliff Waddell Episodul: "The Adventure of the Blunt Instrument"
1975 Three for the Road Ethan Crawford Episodul: "The Trail of Bigfoot"
1977 Quinn Martin's Tales of the Unexpected Richard Ayres Episodul: "No Way Out"
1978 Greatest Heroes of the Bible Hissar Episodul: "Daniel in the Lion's Den"
1983 The A-Team Officer Collins Episodul: "A Small and Deadly War"
1985 Miami Vice Jack Gretsky Episodul: "Bushido"
1988 Murder, She Wrote Eliot Easterbrook Episodul: "Deadpan"
1989 The Twilight Zone Martin Decker Episodul: "Room 2426"
1992 Picket Fences Phil Banks Episodul: "Pilot"
1994 Chicago Hope Robert St. Clair Episodul: "Songs from the Cuckoo Birds"
1994 The New Adventures of Superman Presten Carpenter Episode: "The Rival"
1995 Nowhere Man Gus Shepherd Episodul: "You Really Got a Hold on Me"
1999 The Drew Carey Show Hal Episodul: "Y2K, You're Okay"
2002 Star Trek: Enterprise Colonel Grat Episodul: "Detained"
2002 Stargate SG-1 Doctor Kieran Episodul: "Shadow Play"
2008 Crash Frankie Navajo Episodul: "Los Muertos"
2014 Enlisted Dan Episodul: "Vets"
2014 NCIS: New Orleans Tom Hamilton Episodul: "Chasing Ghosts"